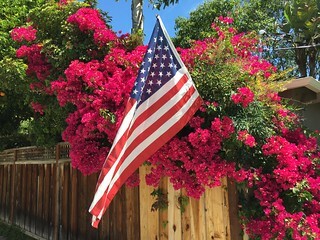 While the eyes of America and the world were on the contest for the US Presidency, our Willow Glen neighborhood in San Jose was locked in a passionate political race of its own. 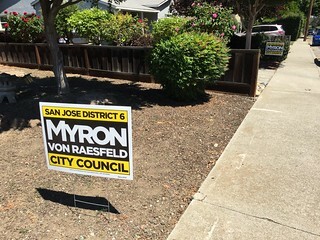 Our City Council seat will be opened up by term limits, so eight candidates ran for District 6 (Willow Glen) in yesterday’s election. 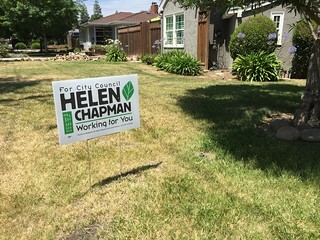 In November 2016, there will be a run off between the two top-vote-earners, both of the women in the race: Helen K. Chapman (who earned 19.82%, with 3,247 votes) and Devora “Dev” Joan Davis (who earned 20.88%, with 3,421 votes). 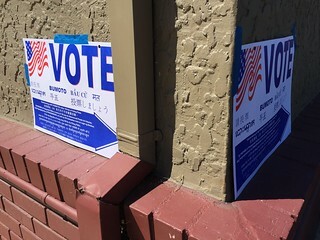 Four other districts held City Council elections yesterday but District 6 gathered the most candidates and the most votes (16,381 counted, with 52 of 52 precincts reporting). 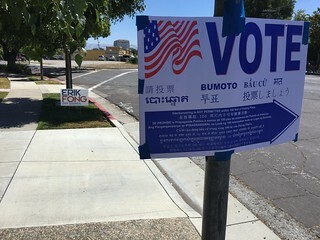 These numbers are based on 70% of the Santa Clara County ballots counted. 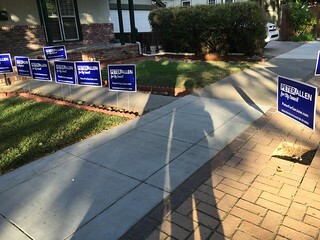 I did not see even one sign out in Willow Glen yards for any presidential or senatorial or Assembly candidate (US or California) but all eight candidates in our San Jose City Council District 6 race generated much signage. 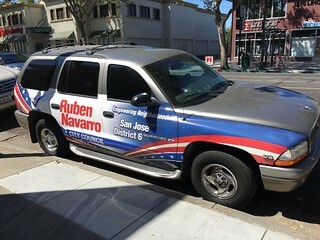 The most creative effort I saw was from candidate Reuben Navarro (or one of his supporters) who wrapped his car in political advertising (see photo below). 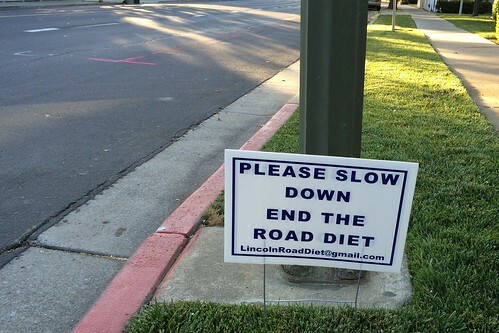 The Road Diet controversy was much discussed by the candidates and by Willow Glen. Chapman’s statement on the Road Diet says that a full review is needed. 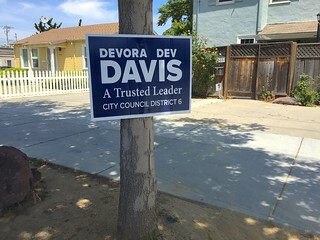 Davis does not give a statement about the Road Diet on her website but on 31 March 2016 told the press she was waiting to see its impact. 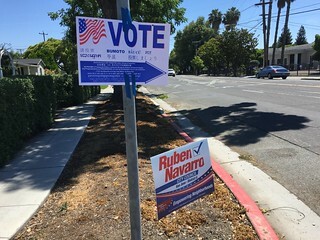 Our incumbent City Councilman for District 6, Pierluigi Oliverio, proposed the Road Diet project in 2014 and it has probably been the most debated effort of his political career so far. In yesterday’s election, Oliverio unsuccessfully ran for US Congress, earning just over 4% of the votes in the current count. 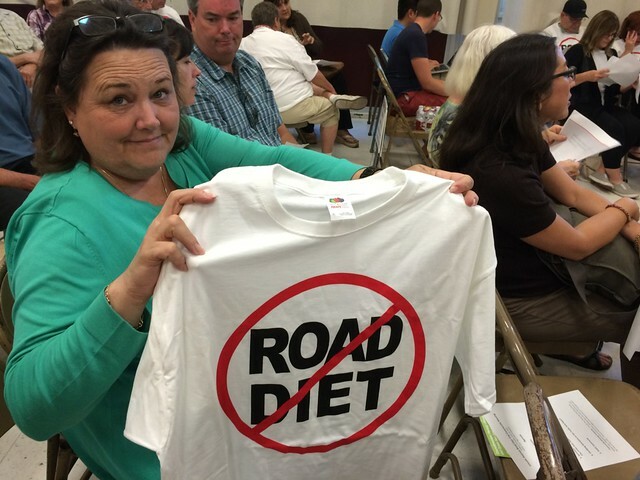 Observation indicates that the Road Diet has failed in all three of its goals. 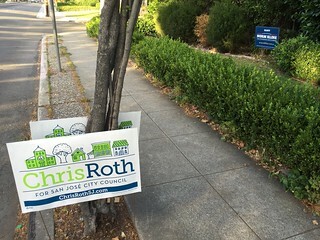 I am looking forward to seeing the data and analysis from SJ-DOT – and to hearing the two remaining City Council candidates address this vexatious local issue. 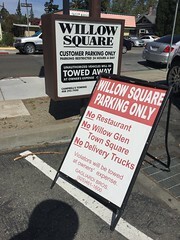 Our family has lived in Willow Glen for almost twenty years. It is a comfortable and neighborly area of San Jose, California with large gardens, good restaurants and shops, and charming architecture. 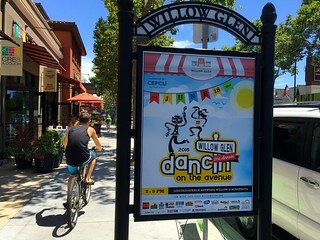 Lincoln Avenue – the neighborhood’s downtown – is part of what makes Willow Glen a “San Jose Treasure”. 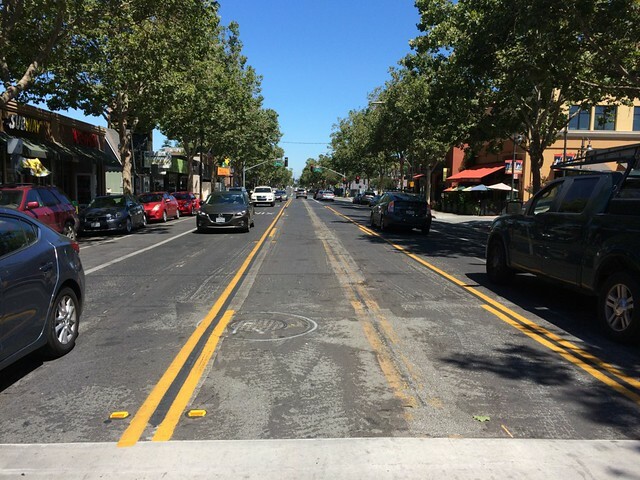 Unfortunately, during the last year Lincoln Avenue has been inflicted with a “Road Diet” which has increased traffic and accidents while discouraging customers from shopping and dining in its otherwise-attractive small businesses. 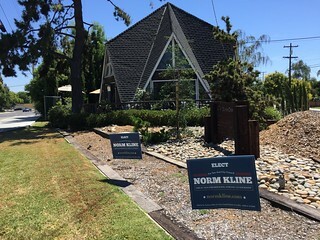 I do not understand why the failed Road Diet is so popular with Willow Glen’s political leaders (and candidates for political leadership). During this last year, I have spoken regularly with Lincoln Avenue small business owners who are to a person upset at their loss of business due to heavy and dangerous traffic combined with too-little parking. 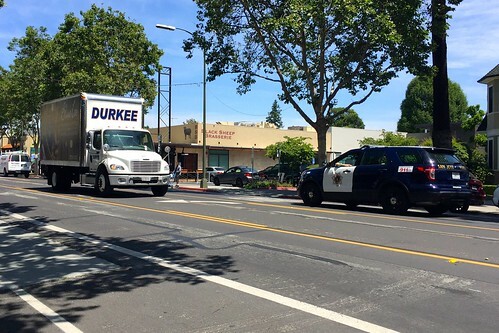 One small business owner told me that in her own observation, Lincoln Avenue accidents have more than tripled this year (eighteen accidents since the five reported by the San Jose Department of Transportation “SJ-DOT” at the 18 June 2015 public hearing). The SJ-DOT web page has posted no more current information since “Lincoln Avenue Road Diet Trial” slides from that public hearing. I have a call into the SJ-DOT office to see if I can get better information. 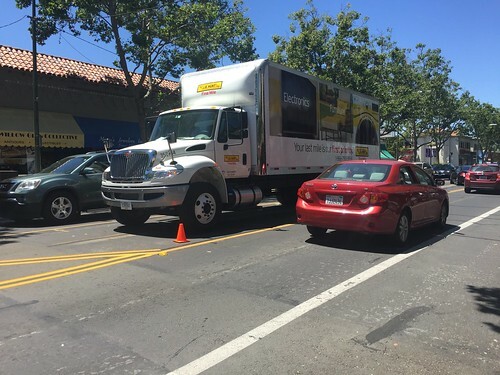 As you can see from the photos (taken this week), big trucks routinely park in the Lincoln Avenue middle passing lane to make deliveries, reducing what was a four-lane road in early 2015 to a two-lane road with two bike lanes now. Neighbors have told me that traffic on side streets around Lincoln Avenue (between Willow/Minnesota) is heavier and often dangerously fast – because drivers are trying to get around the traffic jams downtown. I walk down Lincoln Avenue most days and dodging bicycles on the sidewalk is a frequent hazard. I have been told that many cyclists do not want to use the bike lanes because they are too dangerous with all of the traffic. Considering its stated Purposes, the Road Diet seems to be a complete failure. Bad for Business: The Road Diet trial has reportedly had a very negative effect on local businesses (particularly in the 0.4 mile downtown area on Lincoln Avenue between Willow Street and Minnesota Avenue). Many small business owners at the meeting spoke of a significant decline due to customer frustration with traffic congestion. Several spoke about shopping elsewhere to avoid the intermittent Lincoln Avenue gridlock. 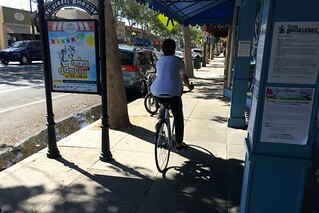 Good for Bikes: Several in the bicycling community reported their satisfaction at having a new bike lane, even if it does not connect yet to other bike corridors. Driver Frustration caused by increased traffic congestion on Lincoln Avenue was a common topic. Data, Analysis, and Interpretation: Questions were raised by many about Road Diet data – as well as concern about key elements (like accidents, pedestrian traffic, and parking) not being measured at all. What is a Road Diet? Watch this video to learn about road diets. 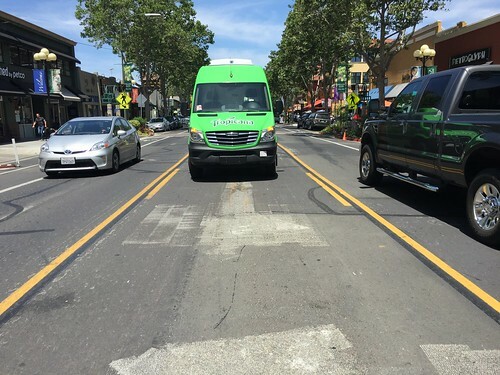 A recent news story “San Jose: Lincoln Avenue ‘road diet’ divides Willow Glen community” reported on how the Road Diet is polarizing this small community. 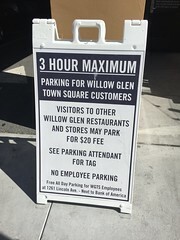 DOT staff reported at length on traffic volume and speed data for 45 locations in the Willow Glen area. However, on 18 June, the DOT was not able to present information indicating success on any of the three goals. For example, DOT said they could not report on safety because it would take one to two years of data collection to determine patterns. When pressed, DOT staff said that there were about the same number of accidents reported to the police. Some speakers (including myself) testified to the current situation causing dangerous traffic congestion and frustration for both drivers and walkers at certain times of day. 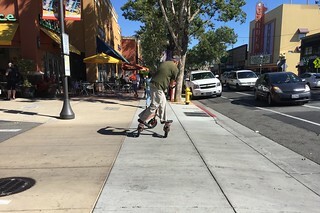 Other members of the public said that they felt safer walking in the area as a result of the Road Diet. DOT reported a small increase in bikers but they did not measure walkers. Clarify and prioritize the goals of the road diet to better gauge whether the road diet successfully achieves its policy objectives. Determine the road diet’s impact on Lincoln Avenue businesses by gathering and analyzing pre- and post-diet data on business sales receipts. 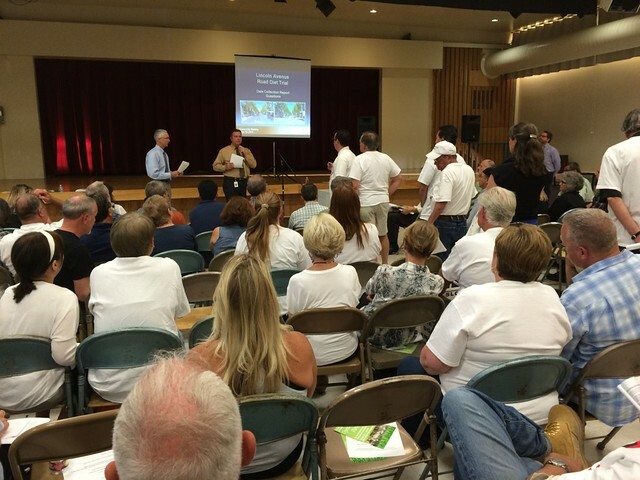 Survey area residents to gauge perceptions of the road diet’s impact on livability. Gather more pedestrian and bicycle traffic count observations over a longer time period to determine if the post-diet increases are statistically significant. Create a pedestrian scramble at both Willow/Lincoln and Minnesota/Lincoln rather than making walkers wait for two long lights. Get rid of the Road Diet middle passing lane (that some were calling the “suicide lane” and others said was often blocked by parked trucks making deliveries), allowing just one lane in each direction, then increase the available parking with diagonal striping, and maybe widen the sidewalks at the same time. 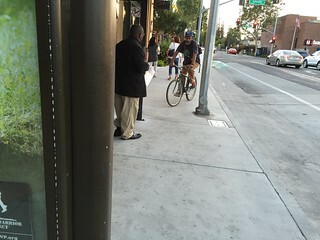 Build a parking structure (for example in the now-empty lot on the corner of Willow/Lincoln) to reduce the number of cars circling trying to find a place to park. The DOT is asking for a quick decision on the success of the 3-month Road Diet so that they can know what to do when they repave Lincoln Avenue in October 2015.